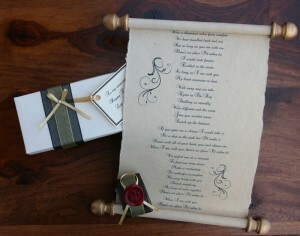 Trinitybox offers 4 collections of personalised gift scrolls as detailed below. 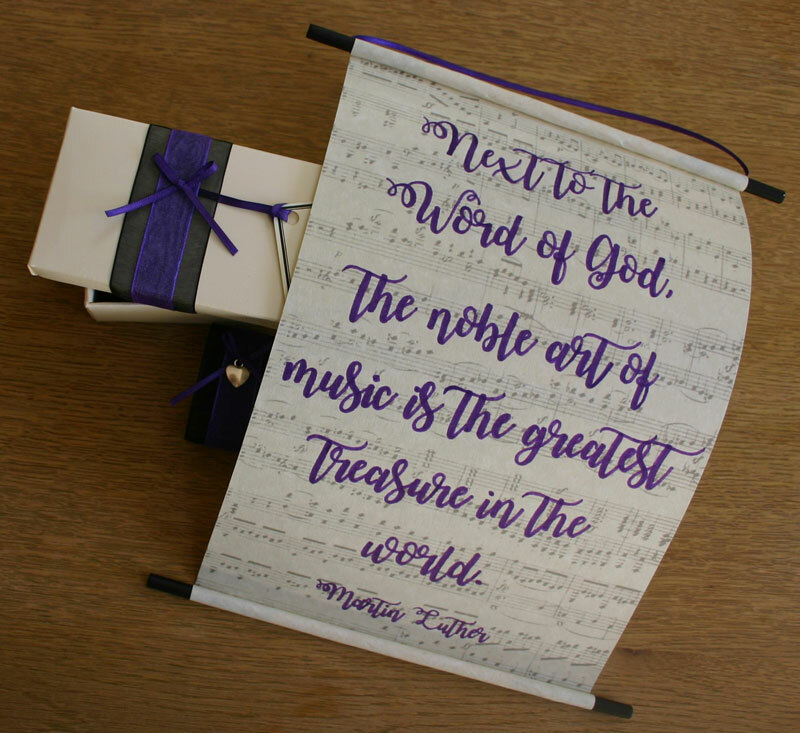 Any message, passage, quotation, Bible verse or prayer can be printed onto your gift scroll with names or dates. In the classic collection, your message is printed on a delicate, ivory coloured parchment paper which you can personalised with names and dates. The scroll is then trimmed with your choice of ribbon and charm, it is then presented in a lovely gift box with tag which can be personalised with a printed message. 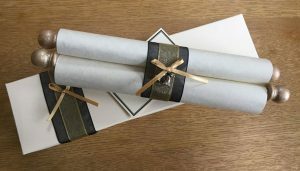 The price of these scrolls start at £40.00. For more details, please click here – Trinitybox gift scrolls – classic collection. The Premium collection of scrolls have an aged appearance. In this collection, your message is printed on wonderful handmade, cotton paper. The paper is given an aged effect, there is an option for burnt effect edges and the text is hand embellished with gold highlights. 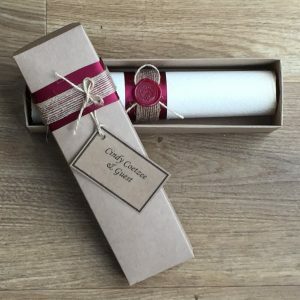 These scrolls are once again trimmed with ribbon, but this time a wax seal is attached to the ribbon to further enhance the antique effect look of these scrolls. The scrolls are presented in an ivory coloured or brown (natural effect) box with tag. The price of these scrolls start at £50. For more details, please click here – Trinitybox gift scrolls – premium collection. Any of the gift scrolls can be presented in this stunning Moroccan, thuya wooden box which will create a real ‘wow’ factor. Please click here for more details. 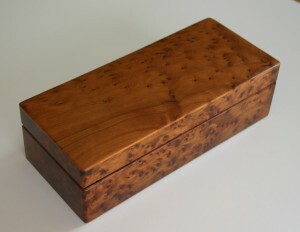 These scrolls are new to Trinitybox. 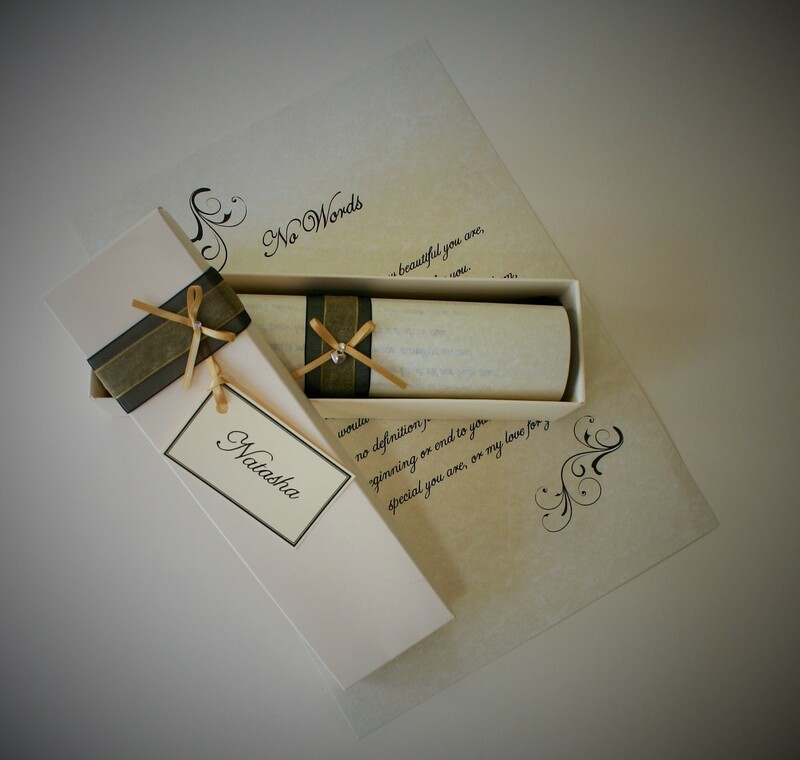 Your chosen quote is hand written on a parchment hanging scroll with black painted dowels, and is trimmed with ribbon, charm and presented in an ivory coloured gift box with coordinating ribbons and hand written gift tag. Please click here for more details on the quotation scrolls. Once you have placed an order, a proof of the scroll will be emailed to you for you to check if any amendments need to be made before printing.